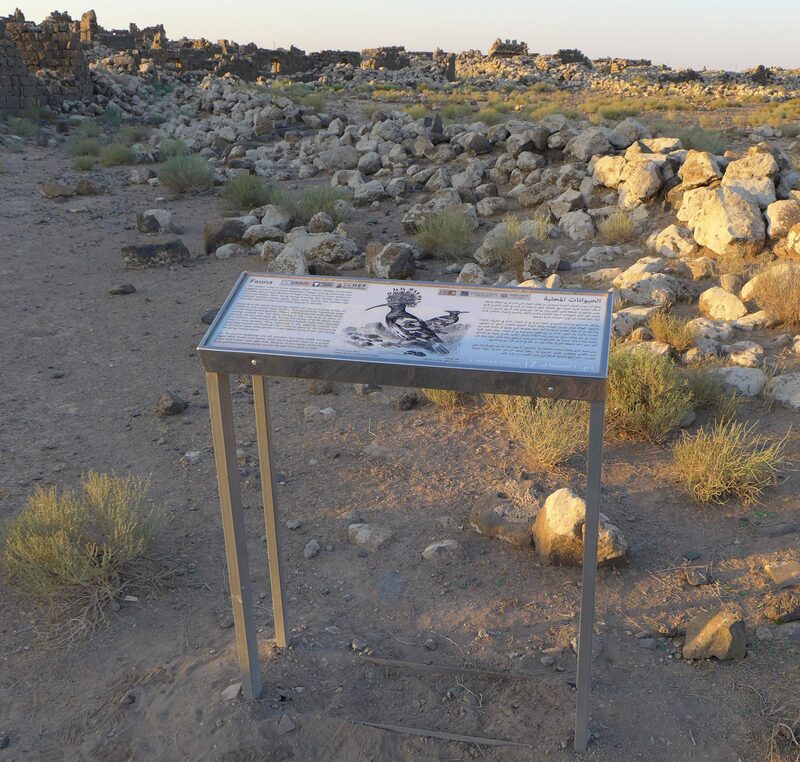 Creation of the East Interpretive Trail was one of the goals of the SCHEP Phase I Project, done in cooperation with the Department of Antiquities, which approved the trail route and vetted the content of the text and graphics developed for the signs. 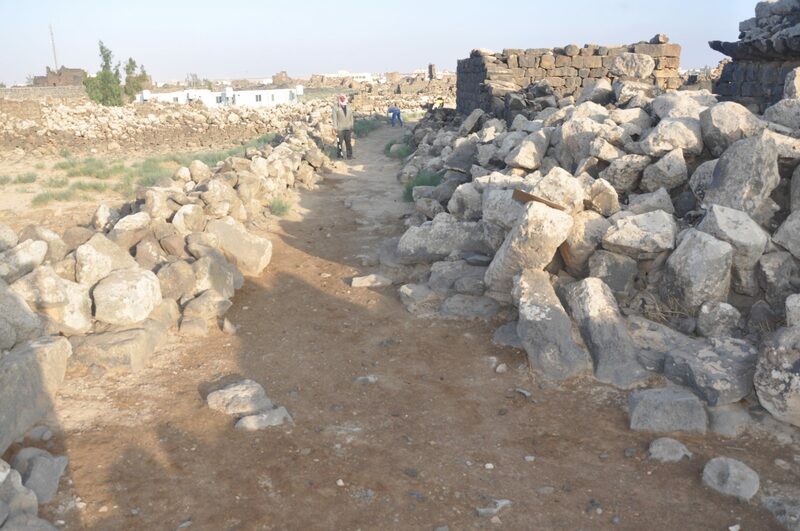 The work was funded by USAID as a component of the ACOR-managed Sustainable Cultural Heritage Through Engagement of Local Communities Project (SCHEP). 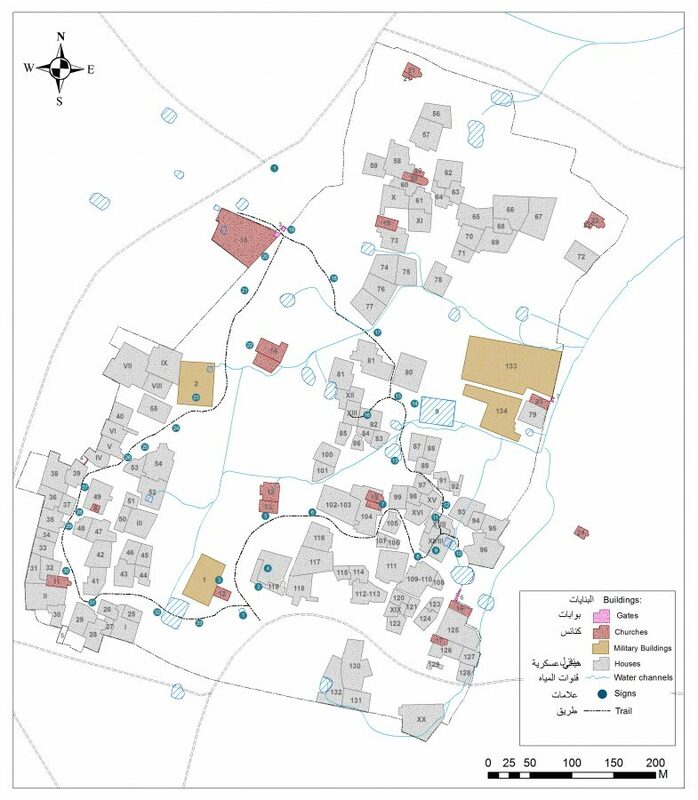 The goal of the trail is to provide a self-guided tour that can be followed by visitors ranging from scholars to school children who are readers of either English or Arabic. This trail links the West Entry Area at the village business center to the Interpretive and Hospitality Center being created at the southeast entry to the site (Figures 1 and 2). The training component of this work included both the preparation of site management specialists and the development of a local signage manufacturing and installation business. The Umm el-Jimal Interpretive Trail was first conceived as a “Walking Tour” which Bert de Vries published in 1982 in Umm el-Jimal: Gem of the Black Desert (Al Kutba Jordan Guides, Amman, Jordan, 21-35). 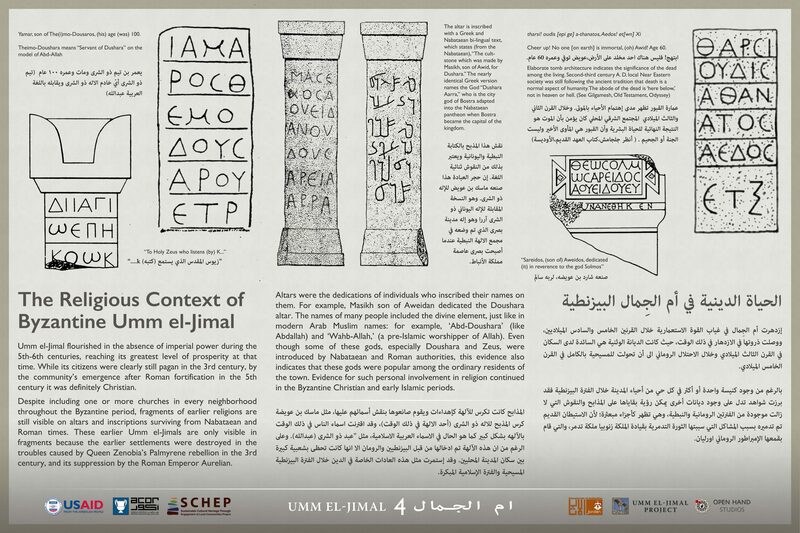 In 2008-2010 the same route was adapted by Paul Christians of Open Hand Studios as a virtual tour on the Umm el-Jimal website, which gives the visitor an audio-visual guided tour with 33 points of interest. 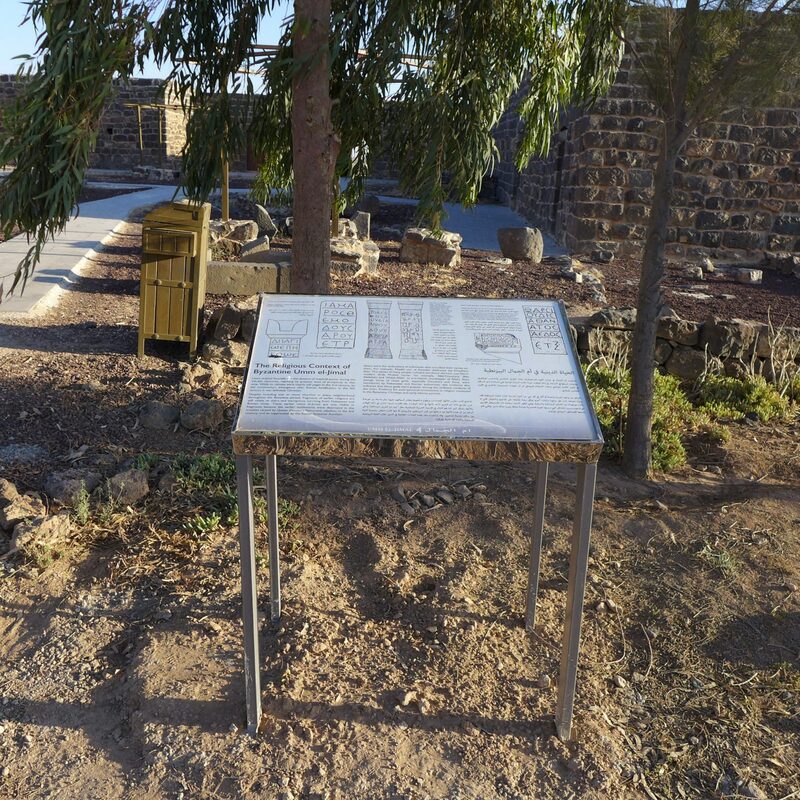 At that time the plan was made to create this tour on the ground with 33 signs replicating the content of the virtual tour. Signs 1-20 were designed and installed during SCHEP Phase I between May 2015 and June 2016. This post reports on the trail’s development and creation of the signage. In May-June of 2015 a crew of 10 site development trainees worked on creating the physical interpretive trail. 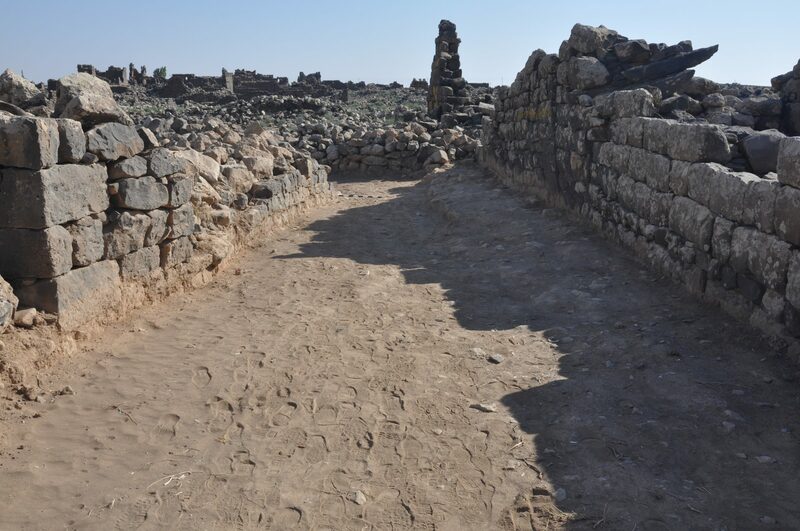 While this had been a somewhat rocky single-file path, it was cleared of collapse debris and leveled to park development standards for accommodating busloads of visitors of varying physical abilities. While the entire trail was systematically documented with before, during, and after photography, the following series of photos illustrate this process at key points along the way. 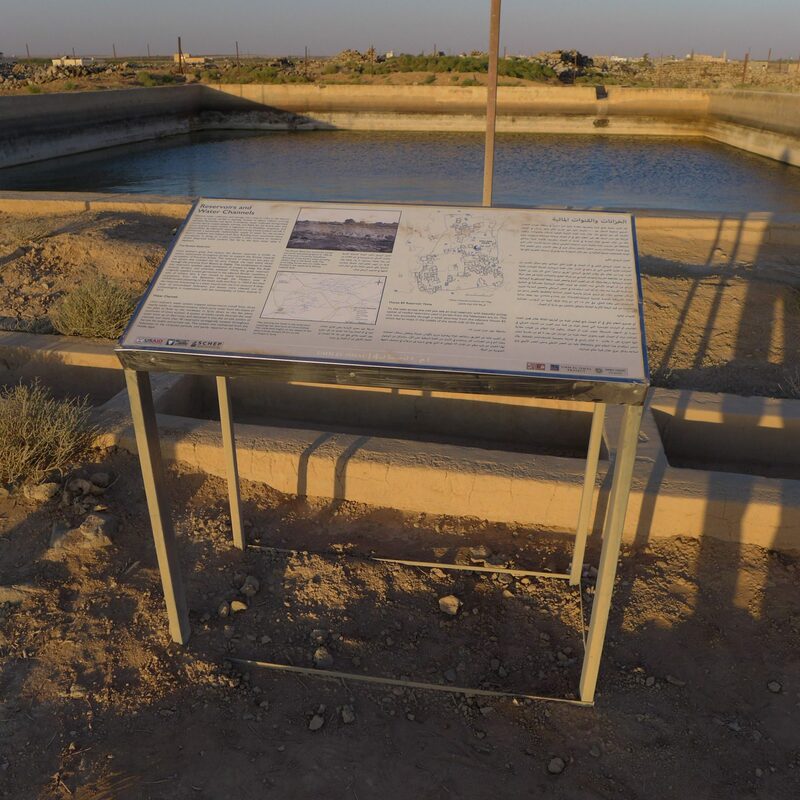 In 2014, an initial set of six signs were designed by the UJP and Open Hand Studios and completed and installed with the aid of Siyaha, a Jordanian tourism development agency project funded by USAID. (See the blog post “Pilot Signage Installed” from 28 October 2014.) The team is grateful to Siyaha and its staff for their generous help with production of these six signs. Long-term maintenance, including site security and replacement of damaged components. Under the supervision of Ms. Maysa Shahateet, Siyaha developed a signage system using graphics imprinted on color-fast ceramic tiles installed on durable metal frames. 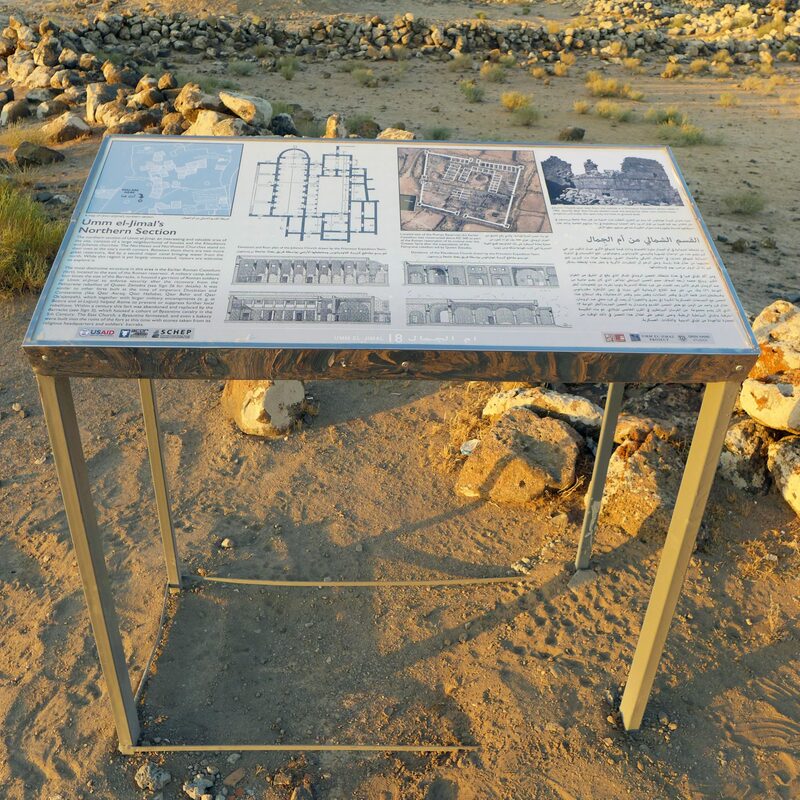 This sign construction was used for major new presentation projects at the Amman Citadel, Petra, and Jerash. The system has been particularly successful at the Citadel, where these signs continue to function very well. With this background, the UJP team agreed to adopt this Siyaha system for its initial six signs created in 2013-4. Their installation in November 2014 instantly enhanced the quality of presentation of House XVII-XVIII just as we were completing its preservation with an AFCP grant. 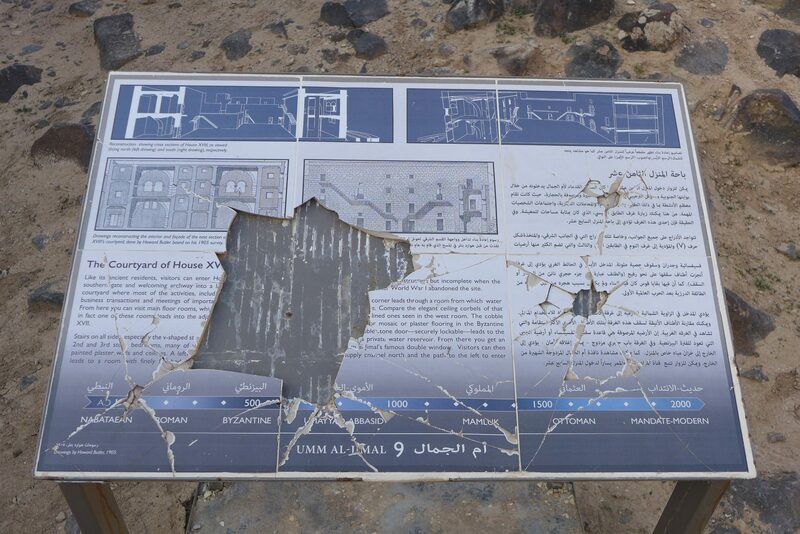 However, damage to the more remote signs began within days, as vandals discovered the ceramic tiles could be cracked easily by smashing them with basalt boulders. At first, the vandals merely cracked the tiles, so that the signs remained useful even though their appearance deteriorated. However, by the end of 2015, four of the six signs were damaged so severely that the information on them was lost. 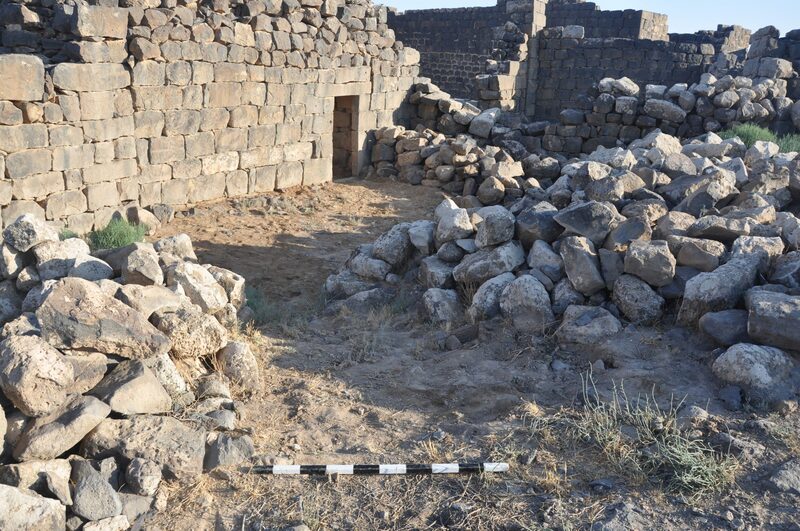 We note that the same failure-by-vandalism took place in Petra. This evolution from pristine to broken can be seen in the following three pictures. The initial concept design has its roots in the pre-computer version of the trail developed for the DoA and Kutba Tour Guides done in 1980-82. 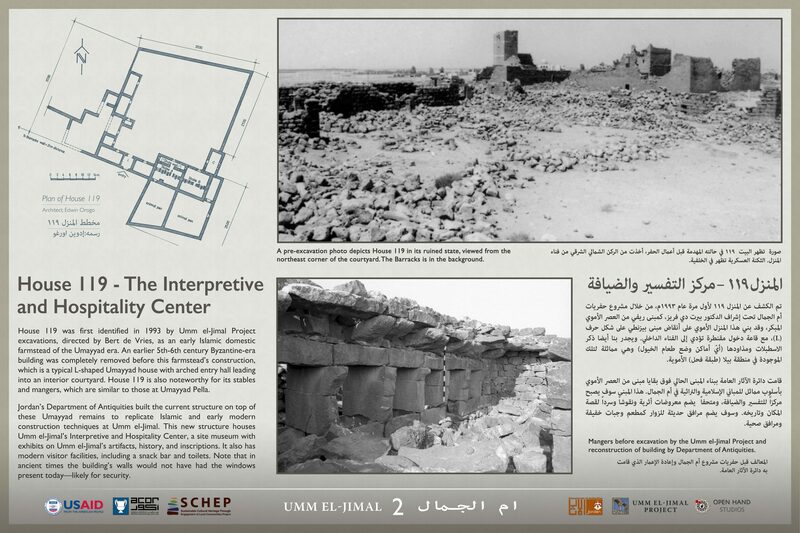 From that time we kept the basic thematic question to be answered on the tour: “How did they live?” While this included Nabataean and Roman antecedents, the answers to this question, guided by the prevalence of surviving houses and churches mainly targeted the Arab people of ancient Byzantine and Umayyad Umm el-Jimal. 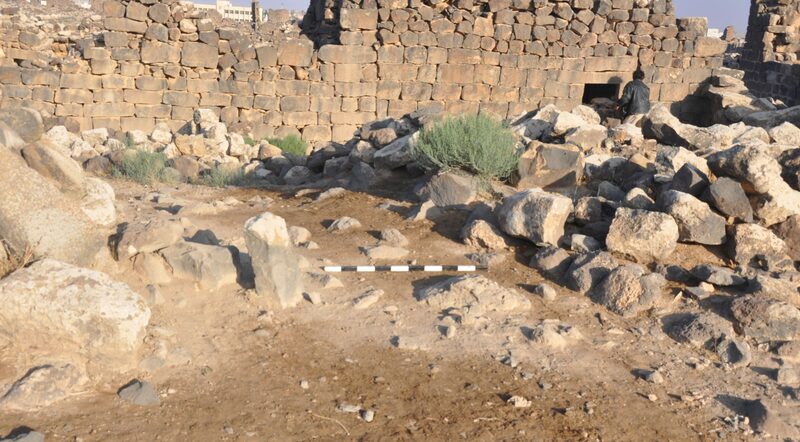 Because so much of the ruins represents the domestic life of these ancient Arabs, we felt that the answers to this question would have a special heritage appeal for so-called “internal” tourists, visitors from Jordan and neighboring Arab countries. 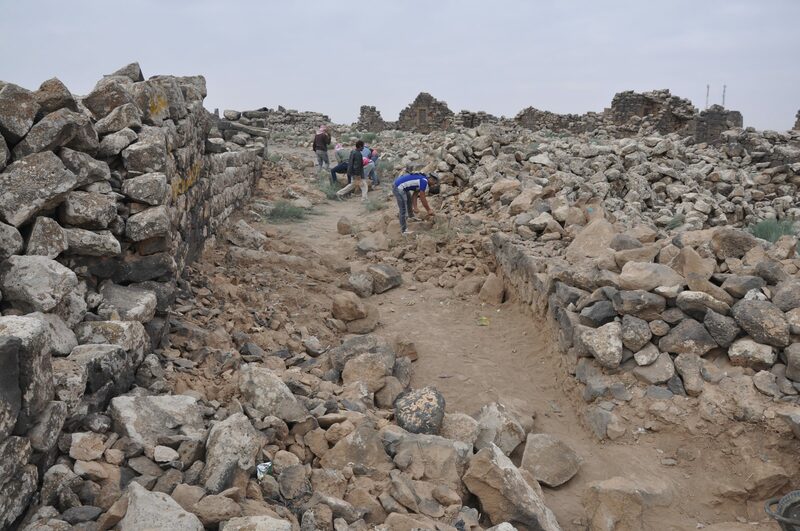 More recently, as we began to engage the local community, we felt this question would appeal to them especially, because they, that is their parents and grandparents, were actually living in and among these Byzantine houses as late as the 1960s. 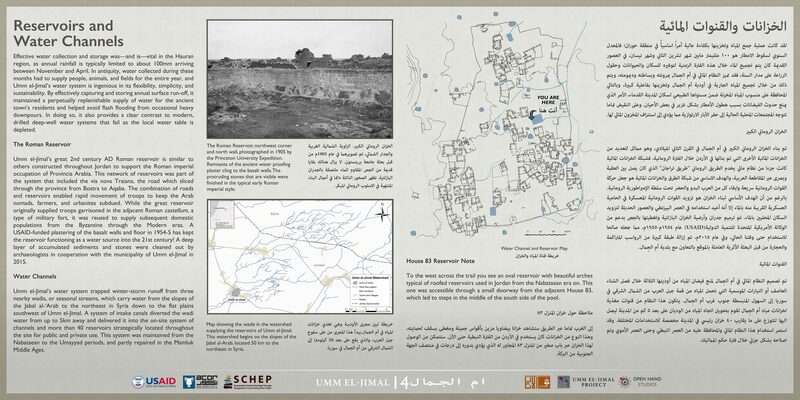 Based on the research done at the site, we developed a comprehensive set of answers that included not only shelter, food, economy, religion and politics, but also the larger socio-economic context, the environment, and the modern residents’ own cultural heritage, which is rooted in the Arab, Nabataean and Roman remnants at the site. 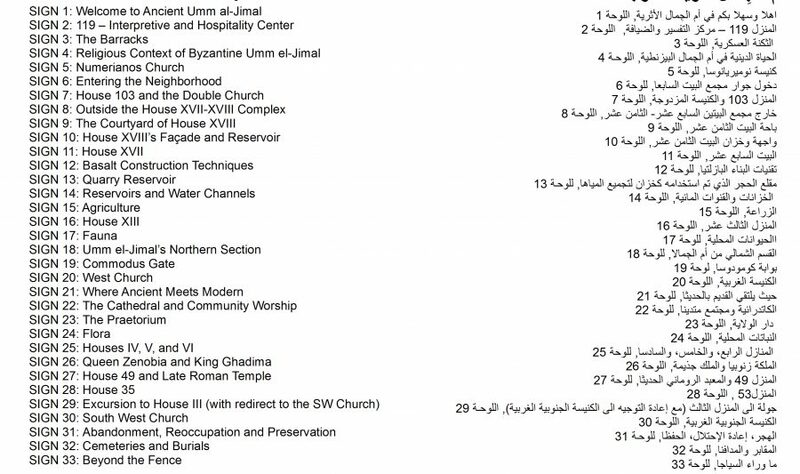 This list of answers evolved into 33 distinct topics, each of which were matched with 33 points of interest on the trail, and for which 33 signs are being designed and constructed (see Figures 1 and 2, above). In developing a strategy for the intellectual level of the content of the signs we decided that they should be instructive and educational for all visitors, ranging from children to adults, from the uninformed to academic experts, from local residents to external tourists, from foreigners who read English to local readers of Arabic. But ‘educational’ also meant a kind of on-site textbook function: Studied comprehensively, these signs can serve as an instructional resource for teaching projects ranging from field schools to school classes and for the training of docents and tour guides. This conscious choice has meant that the information on the signs is not reduced to the standard minimal content of what design firms think visitors will tolerate, but is conveyed at a level we consider is essential to captivate visitors with a truly interesting story that gives them an understanding of ancient lives as revealed by the archaeological research. Therefore, the intellectual content of the signs—in both graphic and verbal form—was carefully assembled by the UJP research team, and then adapted for layout and graphic design by Open Hand Studios according to a thematic template unifying all 33 signs. 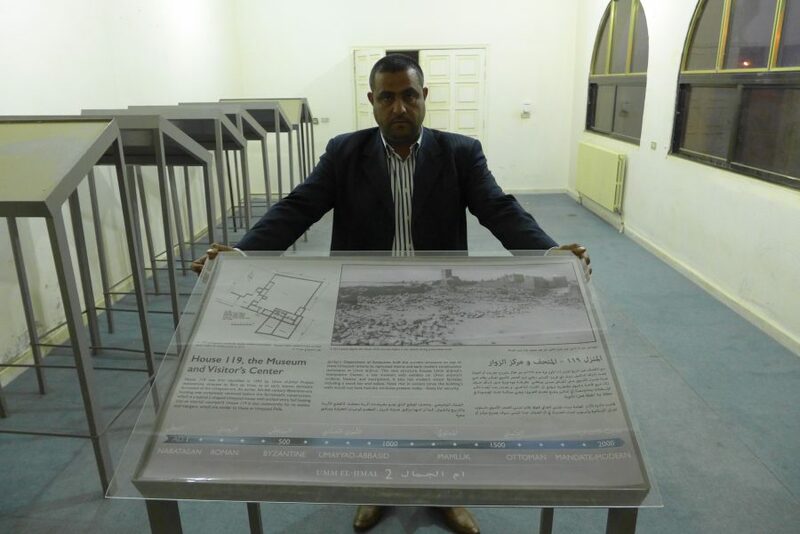 Translation from English to Arabic was done expertly by Abdullah al-Khdeir, and the Department of Antiquities’ policy and fact checking handled graciously by Hanadi Taher. In tribute their great work, photographs and architectural drawings published by the Princeton University Expedition from their 1905-1909 survey are featured on many of our signs. Production design needed (1) to fulfill the goal of devising a local production process at reasonable costs and (2) to discover new materials that would solve the problem of vandalism described above. 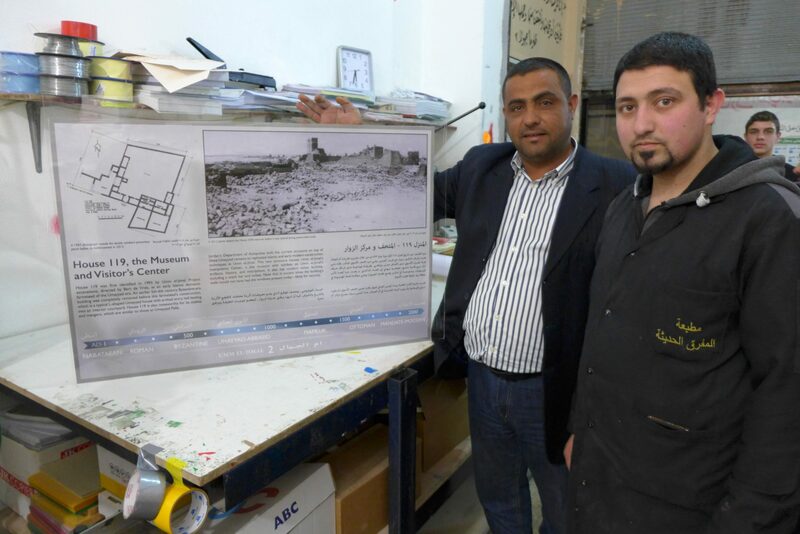 It was understood that the combination of locally available materials and cost-effectiveness would make the signs less sophisticated than, for example the excellent plastic-laminated signs recently installed at Jerash and the Ajloun Castle through another USAID contract. 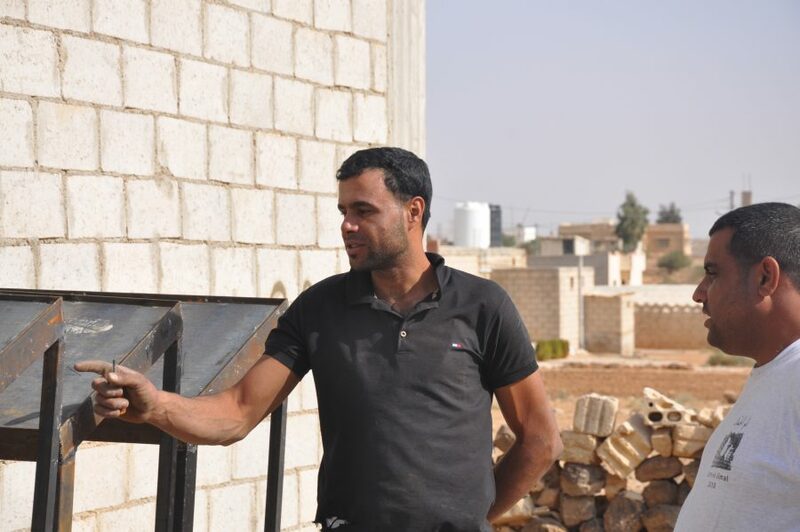 Replicating the simple but durable frames provided by Siyaha was easy, because a local business, Na’il Aqil’s Steel Production workshop was already set up to do this work (Figure 14). This local business, therefore, became the base for both frame production and for the installation of the completed signs. Planning for a less-destructible signage setup was trickier. From the outset we decided that it is impossible to manufacture signs that cannot be vandalized and that are totally impervious to environmental damage. 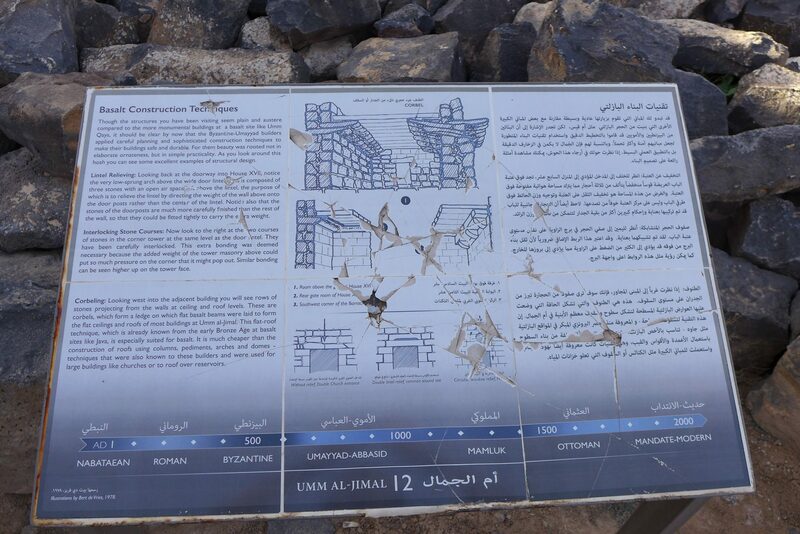 (Even the very durable signs recently installed at the Ajloun Castle already show evidence of graffiti scratched into their hard plastic surface.) A solution, therefore, is to combine reasonable durability with cost-effective replaceability of the signs’ components. We concluded further that no signage project will succeed if successful installation is considered the final step for which funding and effort are required. Rather, it is essential that funding and staff be provided for long-term maintenance. 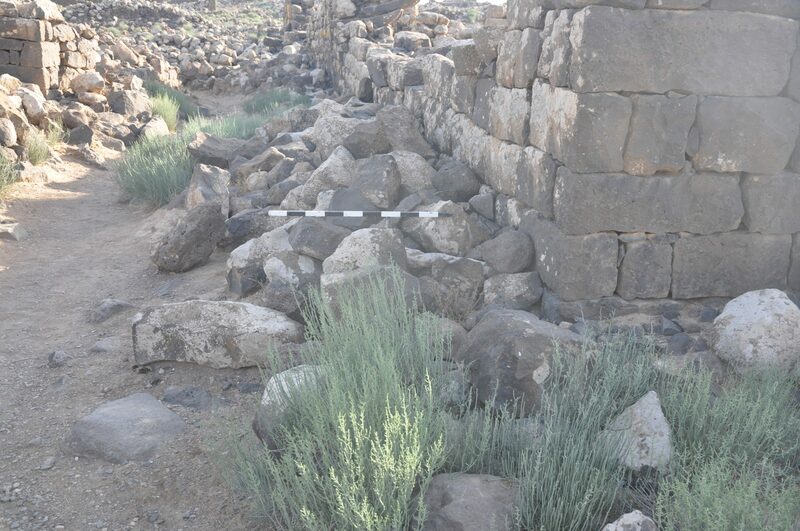 At Umm el-Jimal we have proposed to monitor and maintain the twenty signs we have installed as a component of the second phase of our SCHEP grant project, lasting until March 2018. 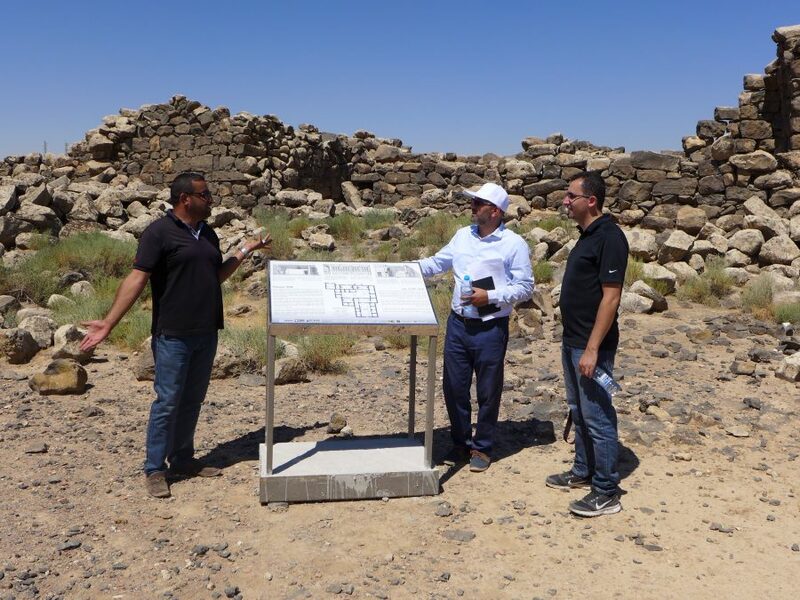 After that the agencies responsible for site maintenance—the Ministry of Tourism and Antiquities (MoTA) and the Department of Antiquities (DoA)—MUST budget for ongoing signage care. Otherwise, the signs will deteriorate beyond repair in a year or two. To work out this plan, project archaeologist Muaffaq Hazza approached a Mafraq printing company specializing in the production of commercial outdoor signage (Figure 15). Together they worked out a three layer system, consisting of (from below) a sheet of hardboard backing, a color-fast printed layer of plastic film, and a cover of clear plexiglass. These components make for a very durable combination, impervious to extreme weather conditions and much more difficult to damage than the ceramic tiles. This three-layer “sandwich” is installed reversibly into the steel frame, so that it can be easily removed to replace damaged components or update the information presented. The twenty signs on which this system has been installed will be carefully monitored. 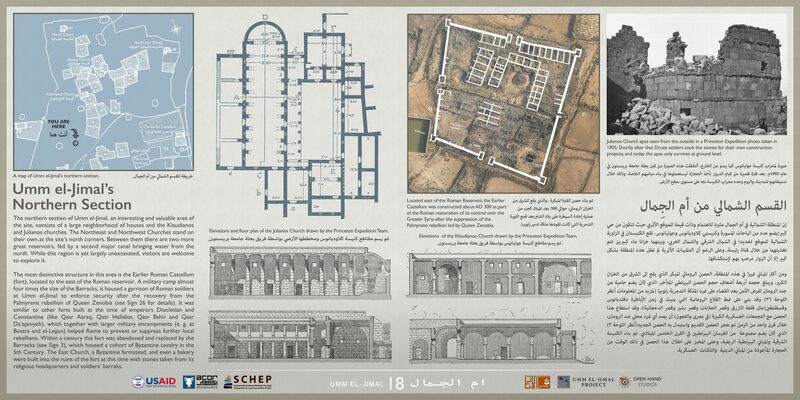 Improvements to the design of all components will be incorporated into the design of the remaining thirteen signs, which will be completed and installed as part of SCHEP Phase II. We conclude that we have met our goals described in this section. We have designed, produced and installed a set of signs that are locally made of durable materials at reasonable costs. Their construction is reversible so that individual material components can be replaced in a regularly scheduled program of monitoring, maintenance and repair. We are making provisions for such a permanent site-signage program over the next 18 months of SCHEP Phase II, and as part of that process will be working with MoTA/DoA in order to make the upkeep of the signs a normal component of the annual site maintenance budget and work routine. In this process we will use the signage production capacity we have created to devise the start-up of a local archaeological signage business and will train digital communication training specialists to add the graphic design component to this firm’s capabilities. 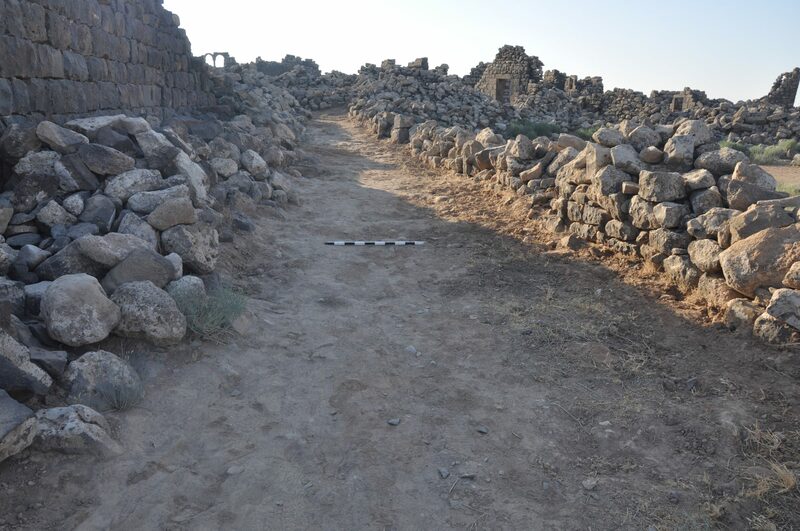 As is being discussed in the photograph below (Figure 25), the west segment of the trail, running from the Commodus Gate past the Cathedral and Praetorium through the southwest neighborhood of Byzantine Umm el-Jimal (see map, Figure 1) will be completed as a component of SCHEP Phase II. It will include the design, manufacture and installation of another thirteen signs, improved on the basis of our experience with the twenty signs installed thus far. However, the outcome will not merely be the production of 33 signs to meet current display needs, but the creation of a signage process that will function for the foreseeable future. Figure credits: All photos by Bert de Vries unless otherwise noted; the captioned date indicates the day the photograph was taken. 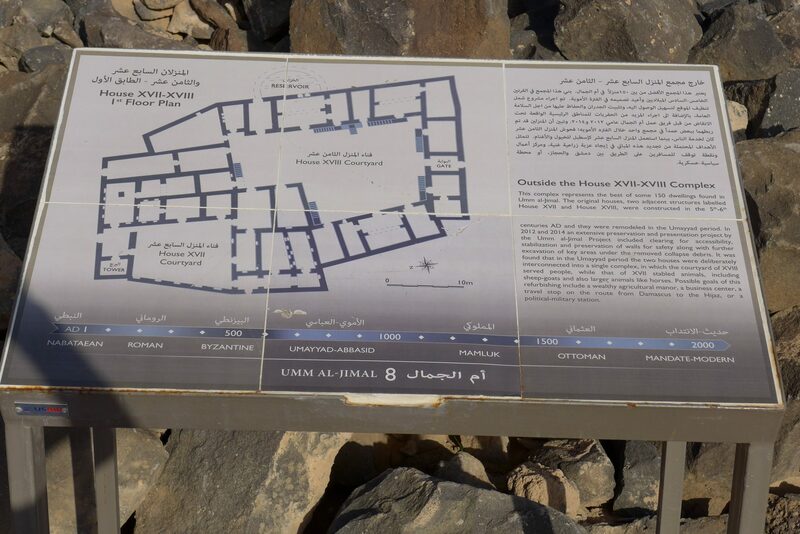 Information on signs by Bert de Vries, layout design by Open Hand Studios, translation to Arabic by Abdullah al-Khdeir, and production oversight by Muaffaq Hazza.